* A paraphrase of Sallustius, Catilinae coniuratio 20.4: “Idem velle atque idem nolle, ea demum firma amicitia est”; that is, the original says “wanting the same and refusing the same”. Augustus de Trey of Peterling, servant of the divine word, and pastor of the French church in Bern, on July 2, 1719.
p. 195. Bern, July 2, 1719. Auguste de Trey was born in 1683. His family came from Trey in Vaud (Waadt) canton: this branch of the family was sometimes also called Guillermaux. From 1714 until his death he was pastor of the French church of Bern. On the bicentennary of the publication of Calvin's Institutio religionis Christianae he preached before the Great Council of Geneva, and was awarded a golden medal. He died in 1756. His son Samuel (1717-?) was first army chaplain of a Swiss regiment in French service, then pastor of the German community of Lausanne. His work written with Johann Jakob Dachs: Les prières ecclésiastiques et la manière de célébrer le service divin, avec les liturgies du baptême, de la Sainte cène et du mariage pour l'usage des églises du Pais de Vaud. Bern, 1725. 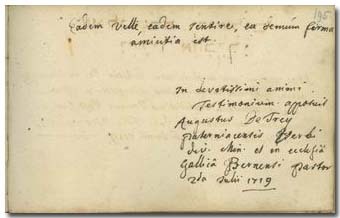 Auguste de Trey in 1719, when he wrote his note in the album of Pápai Páriz, was a pastor in Bern. He also emphasised his being from Peterling (paterniacensis) and his pastor's office (V.D.M.). The village of Peterling (Payerne) in Vaud canton might have been his place of origins or of his earlier pastoral activity.